On 12th July we ran a day-long completion where five teams from three schools across Milton Keynes competed to build a water-powered rocket. The challenge was organised by researchers from the Open University (OU), working with teachers from Denbigh School. Together, we sought to build on the success of previous competitions. Key among the organisers was Alice Dunford, from the OU’s School of Physical Sciences. Alice is studying for a PhD in astronomical imaging. She put her research aside for the day to act as our resident rocket scientist, offering advice and guidance to the competitors. Alice was ably supported by Vic Pearson and Richard Holliman from the OU, Leanne Gunn from Science Made Simple, and myself and Adele Makki from Denbigh School. These contributors each helped to make the day a success. One of the teams working together to design their rockets. 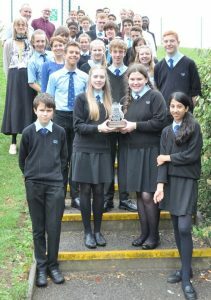 Teams of between five and six students, from Denbigh, Walton High and Sir Herbert Leon Schools, agreed to take part in the competition. The students used old plastic bottles and craft materials to explore different rocket designs. They collected data throughout the day, dodging raindrops in the process, with the aim of improving their rocket’s performance. 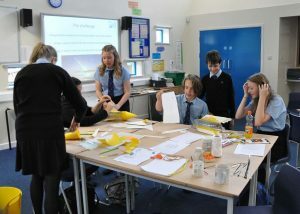 Held at Denbigh School, the teams were judged on who could launch their water-powered bottle rockets the furthest horizontal distance, hit a target with their rockets and present their design ideas and processes. The winning team from Denbigh School. 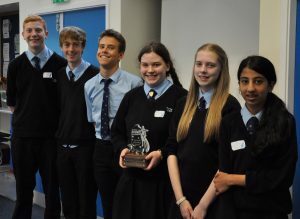 Denbigh School’s team were triumphant, effectively demonstrating their problem-solving skills, design ability, and delivering an impressive presentation on how they made their rocket fly. “The competition is part of a larger collaboration between the Open University and the Denbigh Teaching School Alliance, with the key aim to enrich the existing school curriculum. The competitors and the organisers of the competition. The feedback showed us that this was an enjoyable and rewarding day for the students, in particularly because of the freedom the activity offered students. They also really enjoyed meeting students from other schools. We hope to run the competition again in 2018 as part of the continuing partnership between the Denbigh Teaching School Alliance and the Open University. This post discusses an activity that was developed through the RCUK-funded School-University Partnership Initiative (SUPI). From 2013-2016, the Open University worked in partnership with the Denbigh Teaching School Alliance through the ‘Engaging Opportunities‘ Project. This entry was posted in School-University Engagement and tagged Denbigh school, Engaging opportunities, engaging with school students, RCUK, SUPI on Thursday, 20 July 2017 by Helen Brown.